Love From the Oven posted several delicious cupcake recipes this week. And not just any cupcake recipes, but STUFFED cupcake recipes! You can't tell me that you don't want to lick your computer screen right about now. 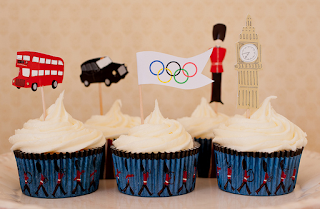 The London Olympic Games are here! Celebrate with Cupcakes! Tonight's the night! The 2012 Olympic Games opening ceremony will be broadcast to the world. An estimated 18 billion people will be watching and I can't wait! I have been watching the Olympic trials over the past month or so and have been getting amped for the Olympics to start. I'm looking forward to being home during the day so I can watch some of the non-primetime events too. I love celebrating every holiday and event with themed cupcakes. 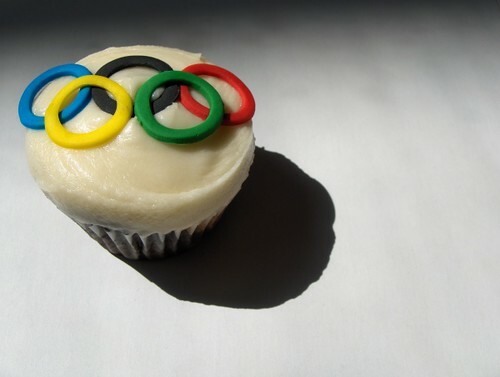 Check out this Olympic cupcake round-up. Need some cupcake karma? How about helping Our Lady of Cupcakes grow by funding a delivery vehicle?! Not only will your money go towards a great cupcake cause, you will also get rewarded with perks such as free cupcakes, a t-shirt, or a cupcake created just for you! Here are the details: KT and Lisa, owners of Our Lady of Cupcakes, have a cupcake catering bakery in Arizona. Their cupcakes are available for purchase at Chocolate Star Bakery in Scottsdale, and they also cater to special events, which means a mode of transportation is extremely important. Through Indiegogo, they are trying to raise $10,000 for a delivery vehicle for their business. So far they've had over $2,000 in contributions, but they need to receive the rest before August 18th or they don't get any of it. This is where you come in. With your donations, you can help grow Our Lady of Cupcakes! And in return, they give you stuff. I like free stuff! For a $5 donation, you get a free cupcake (if you're local), for $25 a special 4-cupcake 'Best of' box, for $250 they will create a cupcake just for you and put it on the menu for life and deliver 2-dozen cupcakes to you! All of the info can be found here. And just for my readers, if you donate $25 or more, you will receive a cupcake jar in addition to the other perks. Just make sure you leave a comment after you donate to let them know where you heard about them from. Here's the donation link, thanks to all! Oreo cookie, chocolate chip cookie, and Biscoff cookie. 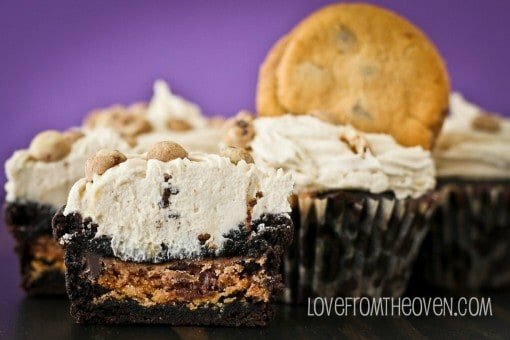 All three of these cookies in one little cupcake. 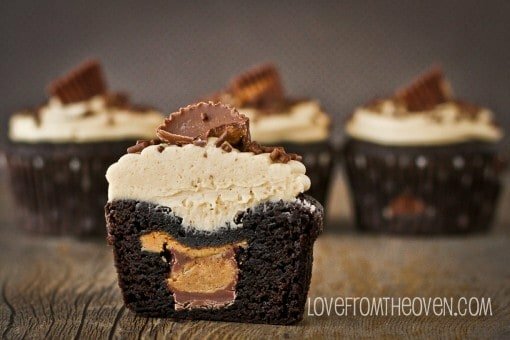 How is it possible to squeeze all of that goodness into one little delicious treat? 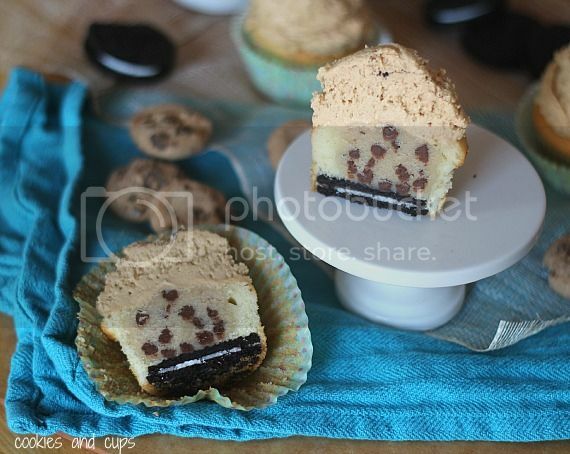 Cookies & cups came up with the recipe for Cookie Crazy Cupcakes. How can you go wrong with so much right? Recipe can be found here. The OC Fair is officially open! As I mentioned earlier this month, the OC Fair Cupcake Classic is coming up in a few weeks. This year, instead of being a judge at the Cupcake Classic (as I was in 2010 and 2011), I got to judge the Culinary Arts competition. The judging for this event takes place before the fair opens to the public. The winners then have their desserts on display throughout the duration of the fair. The Culinary Art division of the OC Fair is made up of several categories: Baked Goods, Confections, Sugar Art, and Table Settings. I didn't know ahead of time which category I would be judging, but I was hoping it wouldn't be table settings (I don't know anything about them and I certainly can't eat them). I soon found out that I, along with Lyle of Meringue Bake Shop, and another judge, would be judging single-layer cakes, cheesecakes, and cupcakes. I couldn't wait! The exhibition hall for the competition looked fabulous! There were so many desserts filling the hall. When I asked how many items we would be judging, I was told 120. I thought she was kidding. Nope, 120 desserts! I was overwhemled but ready. We started off judging the single-layer cake division, which had many sub-divisions including bundt cakes, pound cakes, fruit-filled cakes, and cheesecakes (yum!). Someone even submitted a fruit cake (sorry, but that just isn't going to earn a ribbon). The real party started when we got to the largest division: CUPCAKES! I was really impressed with the caliber of the cupcakes. 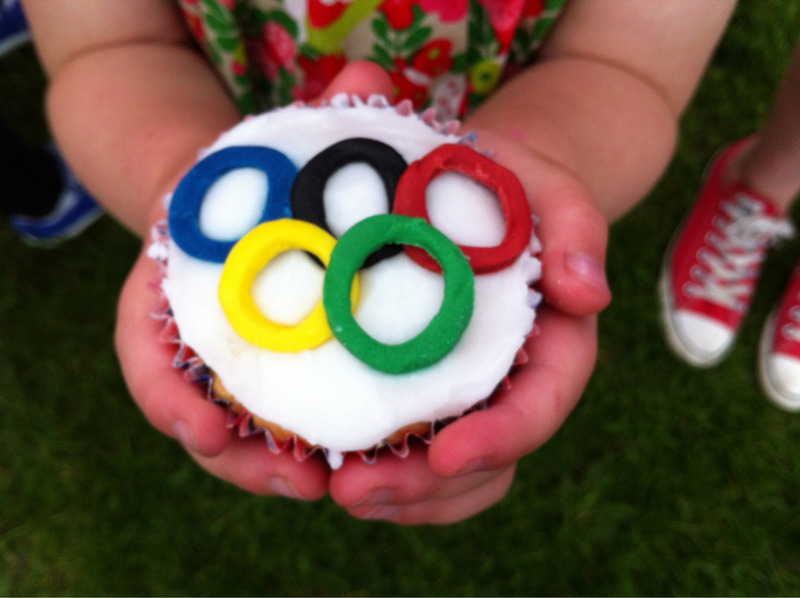 These were baked by amateur bakers, yet some of the cupcakes were outstanding! My favorites were strawberry lemonade, maple bacon, and chocolate chocolate. I never thought I would get to the point were I tasted and spit desserts, but when you have 120 things to judge, it will eventually happen. BUT I will say that I didn't feel extremely over-full after it was over. 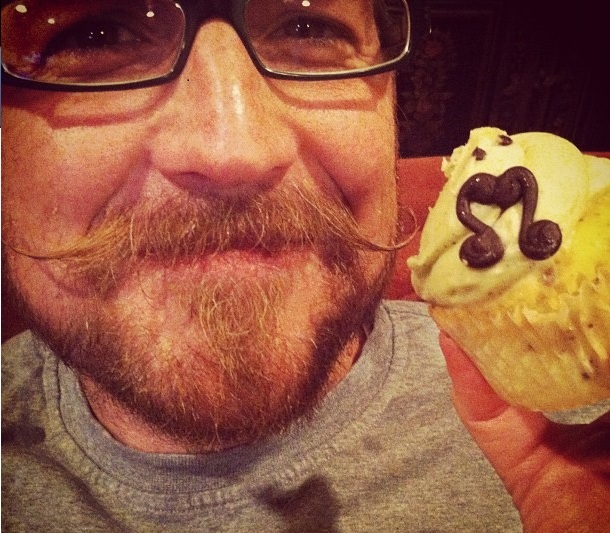 Maybe a new strategy I'll have to try again at my next cupcake competition. You can view the winner's of the culinary arts competition at the OC Fair from July 13-August 12. I'm heading back to the fair this weekend to "test" the other fair food. Honey-dipped corn dog, anyone? What Have I Been Baking Lately? I am so good at eating desserts! I could eat desserts for a living if needed. (If anyone knows how I can do that, please contact me.) It's the baking part that I'm not great with. I have good intentions, but sometimes I just don't have the time or patience to perfect my baking skills. I'll use any excuse to bake though. Lately, I've found lots of excuses. It's no secret that Elizabethan Desserts is my favorite cupcake shop. I shout their praises whenever I get the chance. Recently my girlfriends and I took a daytrip down to San Diego. I couldn't drive past Encinitas without stopping by my favorite place. This was their first time and I promised them they would soon love Elizabethan Desserts too. A cupcake parking spot just for me. Follow the rules or no cupcakes for you! I came home with an assortment of flavors. By the time my husband and I devoured them, I realized that I didn't get enough! Flavors chosen: Chocolate Toffee (my new favorite! ), Churro, Monkey Business, Cot-n-Kandy, Grasshopper, Beeze-Kneeze. My friend picked the Mustachio cupcake for her hubby. I couldn't resist posting the photo. There was no way I was leaving without my beloved sugar cookie. I've never tasted a sugar cookie as delicious as this. I have seriously had dreams about this cookie...it's that good. Life wouldn't be worth living without my sweetie. Today is his birthday and he has to work a long day, as well as all weekend. But I am so thankful that I have such a wonderful husband who works hard so I can stay at home with our little baby boy. Happy birthday! I have a weakness for Kahlua Cream Cheese pie from Marie Callender's. 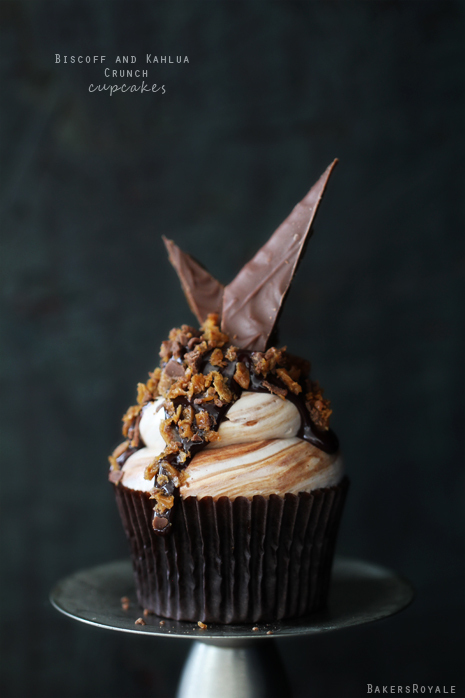 So when I saw a recipe from Bakers Royale for Biscoff and Kahlua Crunch Cupcakes, I didn't need any convincing that it would be delicious! The chocolate cake is made with Kahlua and the frosting is Biscoff marbled with chocolate ganache. Yum! You can find the full recipe here. I knew I loved Sweet and Saucy Shop before a cupcake ever entered my mouth. My first visit to Sweet and Saucy was in 2009. The shop is located in Long Beach, CA, just a bit outside of Orange County. As much as I LOVED everything I ate, I just didn't travel through that area much. So when I heard Sweet and Saucy Shop was expanding to Orange County, I was so extremely excited! And of course I paid a visit during opening week....to, uh, make sure the cupcakes tasted the same as before. Yeah, uh, yeah, that's why I had to stop by. The new location is nestled in the Crystal Cove Promenade in Newport Beach. I visited near the end of the day and the counter was still well-stocked with all kinds of goodies. I couldn't leave without trying a little of everything. And that's exactly what I did: bought one of everything. That's how I roll. Des was a little upset that he couldn't have any sweets. One day, my boy, one day. I picked out so many yummy-looking cupcakes: Oreo, Strawberry Cream, Chocolate Peanut Butter, Chocolate Chip Cookie Dough, Chocolate Chocolate, Coconut, and Candy Bar. Every single flavor was exceptional! 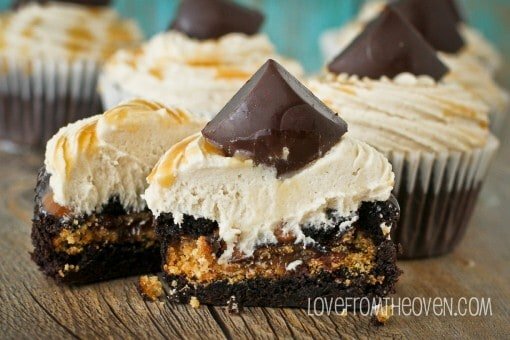 I especially loved Candy Bar with the chocolate ganache filling, peanut butter cream cheese frosting, and salted caramel topping. I didn't want the other desserts to feel left out, so of course I had to bring them home with me too: Chocolate Chip Cookie, Pumpkin Cake Lollipop, Mini Peach Pie, Red Velvet Cake Lollipop, Salted Caramel Macaron. The macaron was perfect! Great consistency, crunchy shell, and creamy center. This was my first mini pie and I loved it! The OC Fair is just around the corner and I couldn't be more excited! I love attending every year because I love the food. I eat pretty healthy most of the time, but when the fair is in town all bets are off! For the past two years I have judged an event at the OC Fair called the OC Cupcake Classic. It is a fun event where amateur bakers around Orange County submit their homemade cupcakes to compete. It is a live judging event, so the bakers get to watch as the judges taste their creations. This year's event takes place on Saturday, August 4 at 1:00pm. There are three categories: fruit flavored, chocolate, and other. Last year I judged only the chocolate cupcakes and I was definitely on chocolate-overload after the event. Entries must be submitted by August 1. You can sign up here. All info about this competition, as well as the other food competitions at the OC Fair can be found here. Today is my favorite holiday of the year! It's starts off with a local 5k, followed by a pancake breakfast, then swimming at my parent's house, BBQ dinner, and finished with a fireworks show. I hope your day is just as fun! I feel like lots of people are doing the green smoothie thing right now. 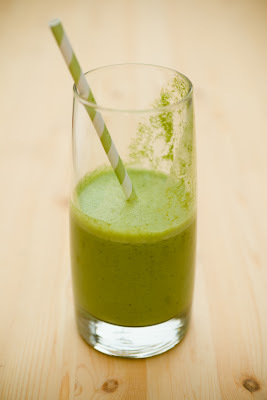 Using their Vitamix blenders to make delicious smoothies every day. Cupcake Project created a cupcake that uses a green smoothie in the batter and the frosting. 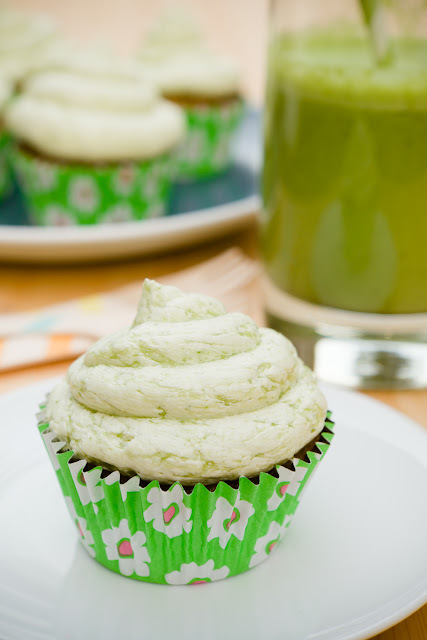 Maybe this makes Green Smoothie Cupcakes healthier than your average cupcake? I'll pretend that's the case. You can find the recipe here.